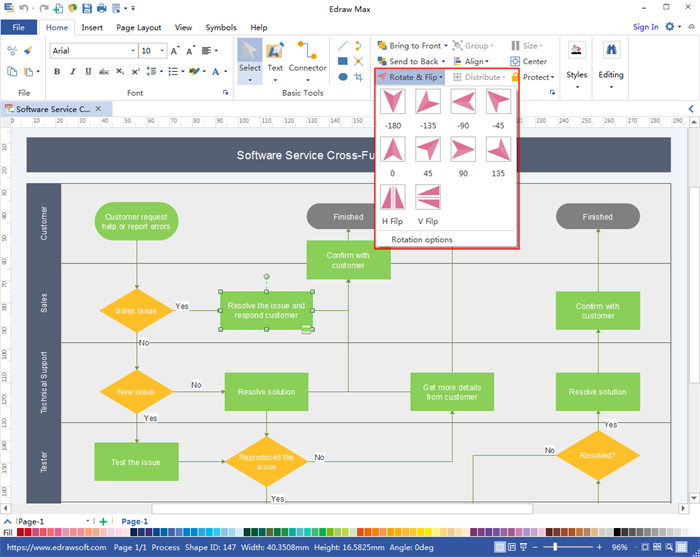 Edraw Max, an economic Visio Editor at a lower cost, could help you import, view, edit, or create new Visio files with ease. A Visio vsdx file often covers graphics, diagrams and charts. Thanks to the diagrams, information becomes easier to understand. Have you ever encountered the problem that you received a Visio file, but you have no access to it. Need options on the best economical Visio editor to edit vsdx files created in Microsoft Visio? Edraw Max, a professional Visio Editor Tool at a lower cost, as the best alternative to MS Visio, would help you a lot. With which, you can import, open, edit, or create new Visio files easily. Just free download and install this Visio File Editor software on your computer. You can simply go to File menu, click “Import” to open and begin editing the Visio vsdx file. Step One: Select the shape. Step Two: Type the text. Tips: go to Home tab>Font section, you can set the font characterisitics, and in the Paragraph group, you can select the text alignment types. Click on the shapes to select it. On the Home tab, you will find the Rotate and Flip options. Just select one you need. With the help of this Visio vsdx file editor, opening, viewing and editing Visio file would be a breeze. Edraw is fully compatible with Microsoft Office. Adding Edraw drawings to Word documents, PowerPoint presentations, or other Office documents is as simple as Copy and Paste. Edraw works perfectly on Windows, Mac, Linux. With more than 12000 built-in vector symbols, drawing could not be easier! This feature can facilitate the coordination among team members for every team member can easily get access to project charts to check any progress or modifications.